Are you unhappy with only having free 7GB existing Skydrive storage and could barely withstand your need of huge storage capacity? Hold on guys, if you’re planning on expanding your Skydrive to a bigger capacity by purchasing it, why not make use of the 20GB of storage that Microsoft is giving out to it’s Windows Phone users? 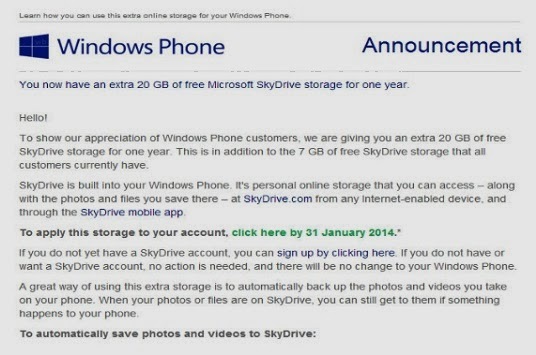 Okay, i received an e-mail from Microsoft saying “To show our appreciation of Windows Phone customers, we are giving you an extra 20 GB of free SkyDrive storage for one year. This is in addition to the 7 GB of free SkyDrive storage that all customers currently have,” Microsoft stated in an email that you could refer at the image on top. Once you click on the link that leads you to redemption in the email, you will immediately get an additional of 20GB which totals up 27GB including you exisiting 7GB Skydrive storage. Do keep in mind that once it reaches the same day of the following year, it will expire and lead you back towards the existing 7GB of storage capacity. So make sure find a alternative storage and backup your data before it expires. Are you a Windows Phone user?Did you receive this email from Microsoft? The All New HTC One aka. HTC M8 or HTC One Two is finally here!